Sorry for the delay in posts. I was traveling for work and forgot to email myself the photos I needed for this post. I made these cupcakes quite a while ago for my friend John's Birthday. 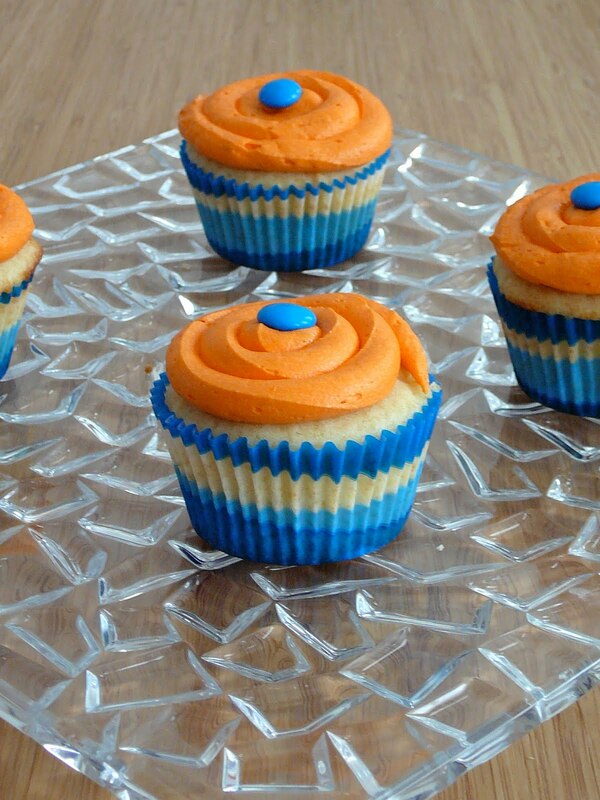 I actually mentioned them in this post: Lemon Cupcakes with Blueberry Buttercream. My intention when I made them was to have a basic vanilla cupcake, but I thought they tasted just like sugar cookies... and they were delightful. I topped them with a orange flavored and colored buttercream which was a great pairing. I wanted to play up the orange color, but feel free to leave out the food coloring. These cupcakes were a hit so I hope you try them! In a medium bowl combine the flour, baking soda, and salt. In a separate mixing bowl, cream the butter and sugar. Beat in the eggs, one at a time. Add the vanilla; mix well. Add the flour mixture to creamed mixture alternately with sour cream (batter will be thick). Fill greased or paper-lined muffin cups with 1/4 cup of batter. Bake at 350 degrees F for 25-30 minutes or until a toothpick inserted near the center comes out clean. Recipe makes approximately 30 cupcakes. Cream sugar, butter, orange zest, and vanilla. Add 4 tablespoons of orange juice and beat until fluffy, adding more if needed. I am posting this recipe for my friend Sarah. I have a few recipes back logged in my recipe file that I could post, but everytime I see or talk to Sarah she says "Are you going to post the Chocolate Peanut Butter Pie recipe?" After seeing her this weekend I decided I would not make her wait any longer. 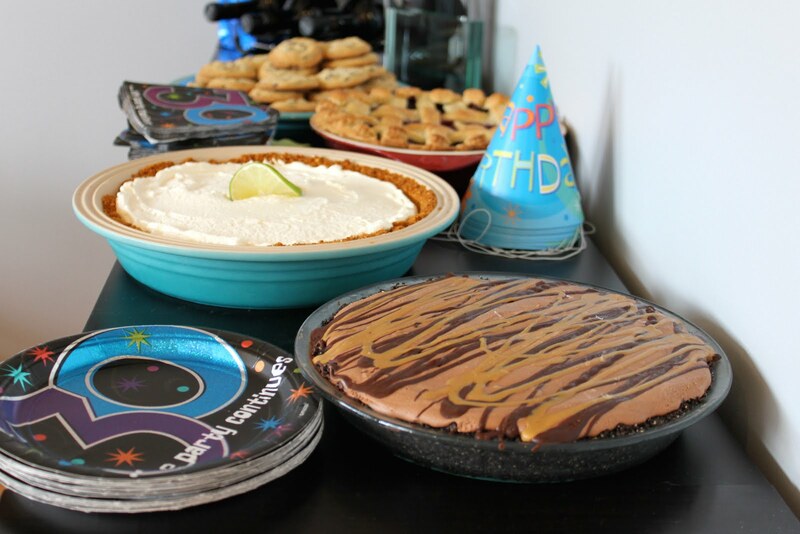 I made this pie for Zack's birthday since I knew he would love the the flavor combination and he did...in addition to everybody else at the party. This pie has several components, so it is not as quick to make as some of the other pies I posted, but it is just as easy and just as delicious! In a food processor or blender, combine the Oreos and the peanuts. Process until finely crumbled. Place the crumbs in a bowl and drizzle with the melted butter, stirring until moistened. Press the crumb mixture into a 9-inch pie pan, covering the bottom and sides evenly. Chill the piecrust in the refrigerator for at least 20 minutes while preparing the other ingredients. Using an electric mixer, combine the peanut butter and cream cheese. Mix on low until creamy. With the mixer still on low, gradually add the powdered sugar, mixing until combined. In a separate bowl beat the cream on medium-high until stiff peaks form to make whipped cream. Using a rubber spatula, gently fold the whipped cream into the peanut butter mixture, adding the whipped cream a little at a time, careful not to overmix. Peel and slice the bananas, about 1/4 inch thick. Lay the half the banana slices in an even layer in the bottom of the chilled piecrust. Spoon the peanut butter filling into the piecrust over the bananas and smooth the top with the back of the spoon. Lay the remaining half of the banana slices in an even layer over the peanut butter filling. 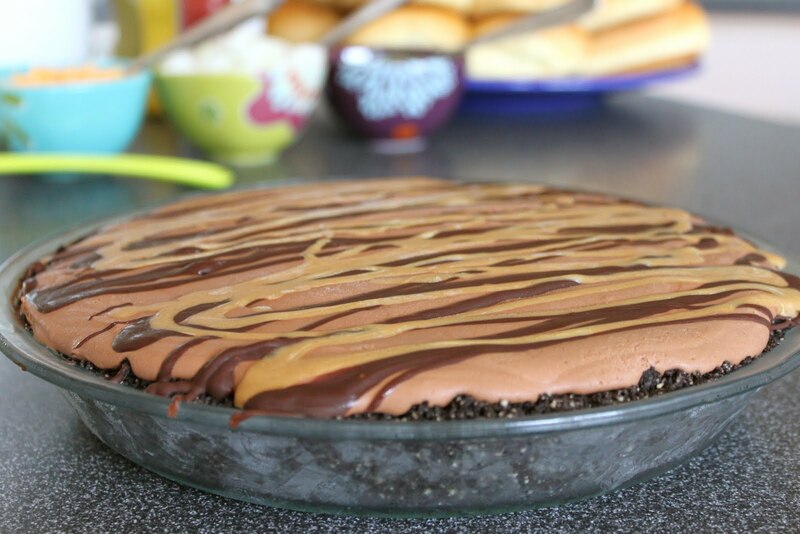 Place pie in fridge while you prepare the chocolate layer. In a microwave safe dish combine the chocolate chips and 1/2 of the cream. Cook on high for 1 to 2 minutes, stirring every 30 seconds until smooth. Cool to room temperature. Stir in sugar & vanilla. Set aside. In small bowl, beat the rest of the cream until soft peaks form. Beat in chocolate mixture on high speed 1/3 at a time. Mix well and gently spoon into pie over the bananas. Garnish as desired. I drizzled melted chocolate and melted peanut butter over the pie. Feel free to sprinkle some crushed Oreos or peanuts. Place in freezer for 30 minutes. Remove from freezer and cover with plastic wrap. Freeze at least four hours before serving. I wish I could eat this everyday. I had no idea what I was getting myself into when I made this S'mores Ice Cream. I knew I wanted to try and make it for a while, but I had no idea Zack and I would love it as much as we did. It was truly incredible. I rank it as one of the best ice creams I have ever had in my life. It is dangerously good...dangerous in the way that you end up eating all of it and then your pants are tight! Let me be the first to say it is worth it, but make sure to have a friend to share with when you indulge. 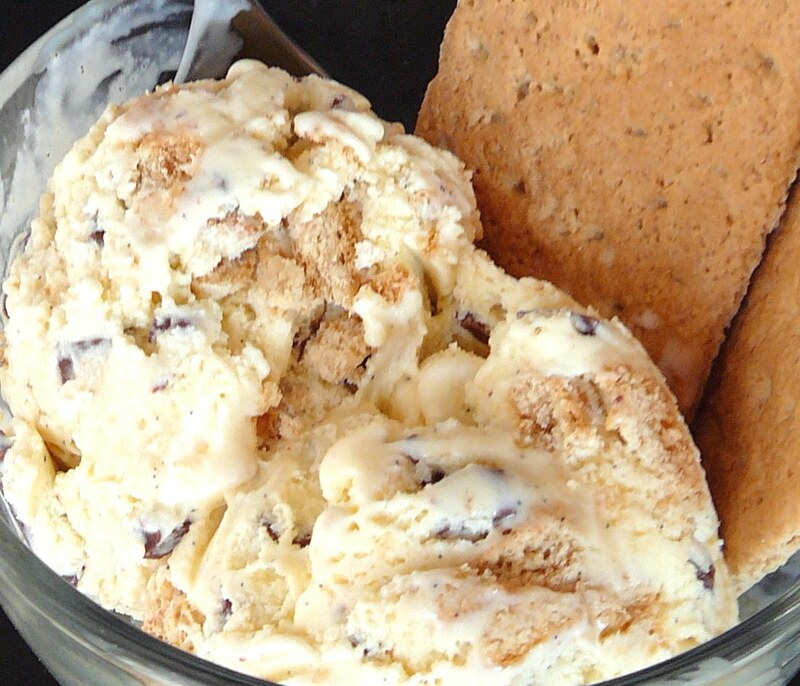 My favorite way to eat this ice cream is sandwiched between two graham crackers. In fact that is exactly what we did after this photo was taken. For those of you who don't have ice cream makers you can still create this ice cream. Just get a quart of your favorite vanilla ice cream. Let it soften slightly and then mix in the graham crackers, marshmallows, and chocolate. Preheat the broiler. On a foil lined baking sheet, place the marshmallows in a single layer; broil until browned. Keep an eye on them as this will happen quickly. Transfer to a plate to cool and set aside. 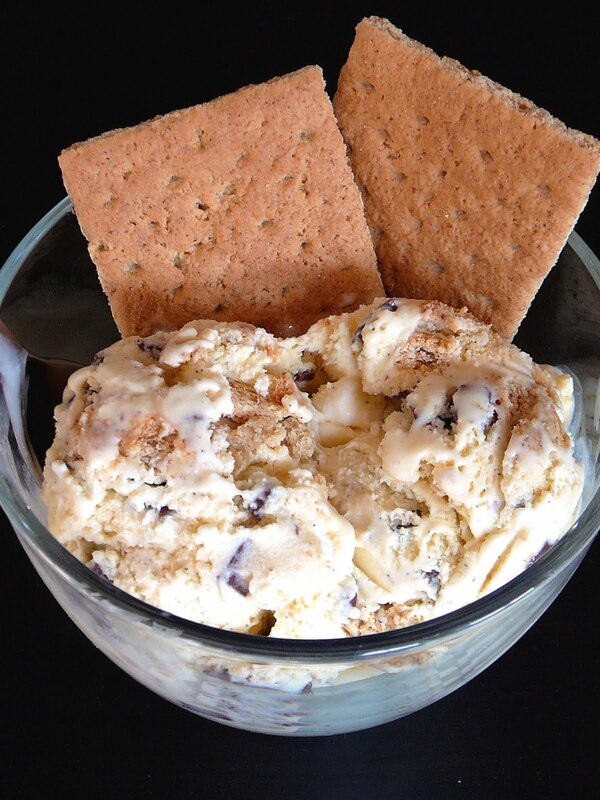 Transfer ice cream to a large bowl and slowly stir in the graham crackers, toasted marshmallows, and chocolate. Transfer to freezer save container and freeze until hardened.